“I know of no precedent of such a solecism during the first hour of a Test match,” wrote Neville Cardus. It was the summer of 1952, and the first morning of the second Test at Lord’s between England and India. Vinoo Mankad had walked out to open the innings and, within the first half-hour, had launched Roly Jenkins for a straight driven six over the sight screen. England won the Test with resources and time to spare. Yet, the match has gone down in history as ‘Mankad’s Test’. The all-rounder top scored with 72 in India’s first innings total of 235. England piled up 537 in response, with Len Hutton and Godfrey Evans hitting centuries. Mankad sent down 73 overs, capturing five wickets for 196. When India proceeded on their uphill task, batting with their backs to the wall in the second innings, Mankad opened the innings again, after 31 overs of bowling that day. He went on to bat for four-and-a-half hours. Mankad went up on the honour board at Lord’s for both batting and bowling — Keith Miller is the only other visiting player to have achieved the feat. Ian Botham emulated Mankad later scoring a hundred and taking five wickets in the same Lord’s Test match. According to Cardus again, Mankad’s Oriental magic had not been exorcised in spite of settling in Haslingden to play Lancashire League. Now, four and a half years later, Mankad had faced the express pace of Fred Trueman without flinching. And his work with the ball had not diminished in any way. Before Kapil Dev changed the equation of Indian cricket by bowling fast and hitting the ball hard, Mulvantrai ‘Vinoo’ Mankad was accepted as the greatest all-rounder to have played for the country. Mankad, through his long career, could hold his own as a genuine batsman. He opened the innings in as many as 40 of his 72 Test innings. With incredible powers of concentration and solid defence, he could also hit the ball hard when required. Possessing a good cover drive and strong leg side strokes, he was perhaps the first Indian batsman to loft balls into vacant areas in the outfield without trying to clear the ground. And as a left-arm spinner, he was one of the best in business. In his early days he toyed with a Chinaman, but wisely gave it up to focus on conventional spin. He sometimes punctuated his orthodox slow break with a faster one that deceived the best of batsmen. He could vary his flight and turn — as the legend goes — in infinitesimal degrees till a batsman playing forward for overs at a stretch suddenly found himself beaten, marginally out of his ground and stumped. Finally, at the end of the day full of heroics with the bat and the ball, his dapper form would never have a hair out of place. He endorsed Brylcreem, and used it too. In The Romance of Indian Cricket, Sujit Mukherjee was almost at a loss about what to name the chapter on this fantastic all-rounder, before deciding on ‘Magnifico’. Born in 1917, Mankad made the first waves in the cricketing ocean against Lord Tennyson’s team that visited India in 1937-38. In the second unofficial ‘Test’, he scored 38 and 88 while picking up two wickets in the two overs he bowled. In the fifth ‘Test’, Mankad scored an unbeaten 113 from No. 3 and picked up 3 for 18 and 3 for 55, as India won by an innings. He finished the series averaging 62.66 with the bat and 14.33 with the ball. It led Tennyson to remark that Mankad would find a place in any World XI. Unfortunately, his international career could not take off during his prime with the action having shifted to the battlegrounds of the Second World War. He had to wait till the 1946 tour of England to make his debut. His versatility was extensively utilised by the inexperienced Indian side. In his first Test he was sent in to open with Vijay Merchant. He did not do too badly, scoring 63 in the second innings. With Mushtaq Ali returning to the side for the remaining Tests, Mankad was pushed down the order.He did not score too many, but did pick up 5 wickets in England’s first innings at Old Trafford. This was some achievement since an injury had temporarily made the threatening faster ball difficult to bowl. This was followed by the eventful tour of Australia in 1947-48. 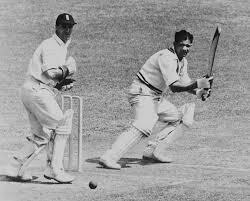 Don Bradman’s side steamrolled over the Indians, but Mankad scored two hundreds. Both centuries came at Melbourne, in the third and fifth Tests. The runs were scored while opening the batting against Ray Lindwall and Keith Miller. And although he did not take too many wickets, he ensured that he would live on in the annals of cricket as a mode of dismissal. In the second Test, he ran out Bill Brown as the latter backed up too far before the ball was bowled. Mankad had dismissed Brown earlier in a tour match in a similar fashion after a warning. There was hardly any excuse for the batsman making the same mistake again. Yet, opinions were divided about Mankad’s action. Vic Richardson supported the Indian bowler while Jack Fingleton did not. The mode of dismissal soon entered the unofficial lexicon of cricket and is referred to as ‘Mankaded’ even today. Bradman also singled out Hazare, Lala Amarnath and Mankad as the best performers in the Indian side. Mankad started playing league cricket in Lancashire from 1947 and remained available to play for India during the winter. His commitments ensured that he could play only in the Test matches when India toured England in 1952. The winter of 1951-52 and the subsequent summer saw some of the greatest performances of the all-rounder. At Madras, on a wicket that was not exactly helpful, Mankad cast a spell over the English batsmen, taking 8 for 52 and 4 for 53 as India registered their first-ever Test win. That summer witnessed the famed ‘Mankad’s Test’ at Lord’s which had Cardus mixing metaphors in a heady cocktail of appreciation. It was his first First-class match of the season, after contractual problems had made him miss the first Test. When Pakistan visited the following winter, Mankad carried on his saga of success, capturing 8 for 52 and 5 for 79 at Delhi as India won their second Test. He was eventually handed the captaincy and led India on the tour of Pakistan. However, the series saw one of the drabbest stalemates of all time. Apart from one five-wicket haul, Mankad did not impress with either bat or ball. It was the following series against New Zealand in 1955-56 that saw some phenomenal batting by the now ageing cricketer. In the second Test at Brabourne Stadium, he scored 223 and picked up 3 wickets in New Zealand’s second innings as India cruised to an innings win. This was followed by the famed 413-run opening partnership with Pankaj Roy a Chennai, a world record that would stand for 52 years. Mankad scored 231 (an Indian record that stood for 28 seasons) and followed it up with 4 second-innings wickets in another innings win. It was a fantastic peak of a sterling career, but the last one. 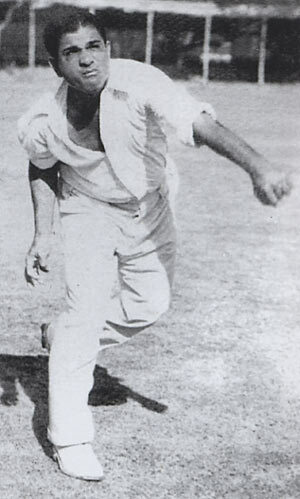 When Australia toured the next year, Mankad’s slowing reflexes found it difficult to counter Lindwall at the top of the order. At Madras he fell trying to steer the Australian fast bowler late, a stroke that had come off with regularity in the backyard of the same foe nine years earlier. However, as is often the case, Mankad was in denial about his decline. In very next innings, at the Brabourne Stadium, he tried to repeat the stroke before scoring a run and was caught in the slips. As a result he was pushed down the order in the third Test. Additionally, while Richie Benaud was skittling the Indian batsmen out, Mankad fell far short of returning the compliment on turning tracks. It was evident that his celebrated powers were dwindling. He missed the first three Tests against West Indies in 1958-59 due to pay disputes with BCCI. However, in a strange game of musical chairs played out by the selectors, he was appointed captain for the fourth Test. He bowled well enough to bag 4 wickets, but India lost by 295 runs. Hemu Adhikari was appointed captain for the last match. By now, at the age of 41, Mankad was batting low down at No. 8. In the fifth Test at Delhi, he bowled 55 overs without a wicket conceding 167 runs — and bowed out of international cricket. In 44 Tests, Mankad scored 2109 runs at 31.47 with five hundreds, and took 162 wickets at 32.32. The figures are indeed great, and might have been even more impressive if he had retired three years earlier. Along with Syd Gregory and Wilfred Rhodes, Mankad remains the only batsman to have batted at all positions in Test cricket. He continued playing First-Class cricket for three more years. Having played for Maharashtra, Gujarat, Bengal and Saurashtra, Mankad had represented Bombay during the years of his pomp. He played the last few seasons for Rajasthan, serving them well with the bat and the ball, the old magic occasionally sparking in the domestic matches. He finally hung up his boots for good in 1962, one of the most recognisable and respected figures in Indian cricket. Even as he walked away for the final time, not a hair was out of place. Vinoo Mankad was honoured with the Padma Bhushan in 1973, and passed away five years later.